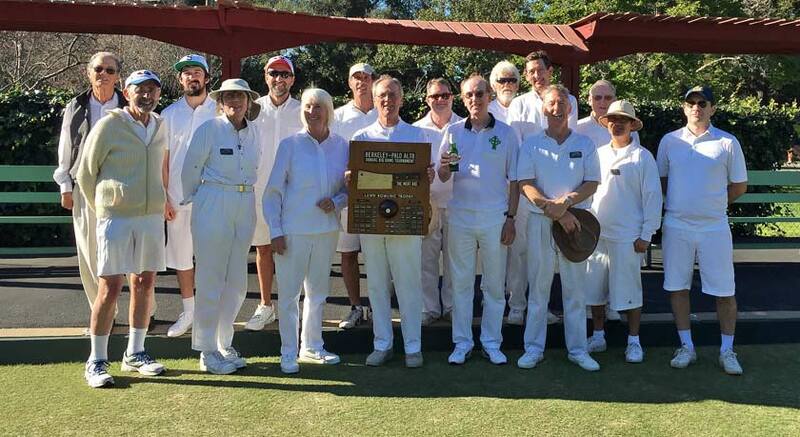 On a beautiful first weekend of August, our club hosted the club’s annual draw mixed triples, and a party to celebrate the big renovation that our club went through this summer, thanks to Ann’s and Bill’s great efforts, and also with the help of many club members who contributed along the way. Twenty one bowlers signed up to play in their preferred positions, resulting in few teams not competing one of their games, and getting an automated victory. The tournament comprised a qualifying session of three 10 end games, a semifinal game of 8 ends for the top four teams, and a final game with 8 ends. All teams bowled two games before lunch, and the third one afterwards: after the qualifying session, only one team had won all their 3 games, while the other three teams were 2-1 and 2 and a tie. Families and friends started to arrive to attend the the bbq, and to cheer for the contenders of the two semifinal games that were under way: on one rink, Shawn, Millard and Keith, our new dual member from Sarasota, played against John, Ann and Laile; one the other rink, Jim, Des and Bill played against Rob, Cris and Leslie. Before the final, Erwin and Laile started the bbq and the spectators started munching while waiting and chilling. As one would expect, the final game between Shawn’s and Rob’s team was a great game, with beautiful shots and spectacular bowling on each side, which kept the spectators entertained and on the edge of their seats until the very end. Shawn’s team, which came in the final undefeated, took an early lead and kept it until the last two ends. Rob’s team was down 9-4, but the score didn’t discourage him nor his teammates, whom he led to score 5 points to tie, with one end to go. 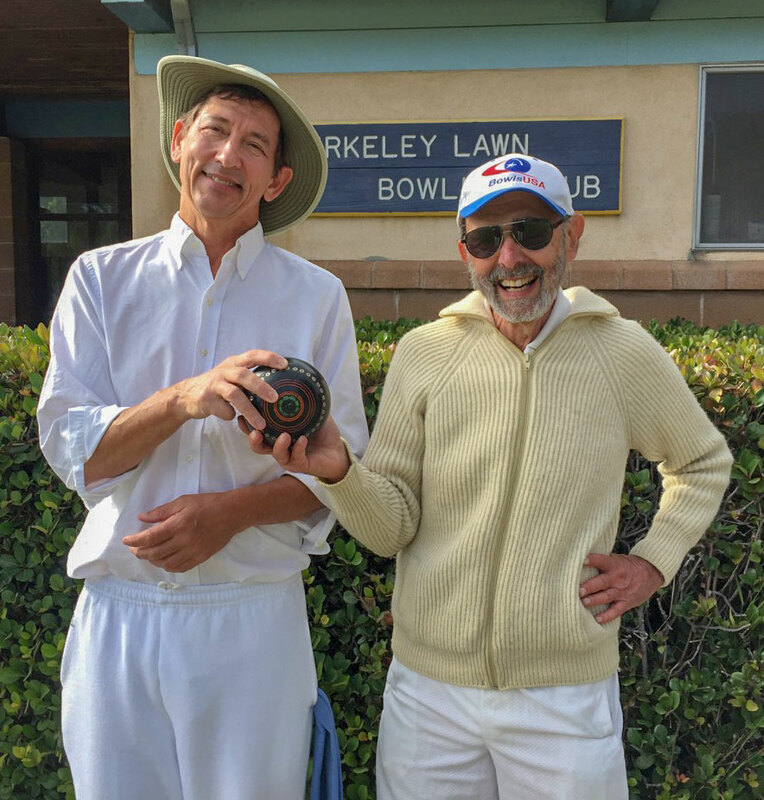 Shawn was still holding shot when the two skips bowled, but eventually Rob drew a shot that in the end, gave his team the victory by two points. After the tournament, we all then gathered inside eating sausages, salads and desserts that were kindly provided by many club members, and drinking beers and other liquors, enjoying our beautiful little club and nice conversations. Thank you to all club members who have contributed to make this event such an enjoyable, fun and memorable day for our club, and many congratulations to Leslie, Cris and Rob for winning this year’s BLBC 2017 Mixed Triples. 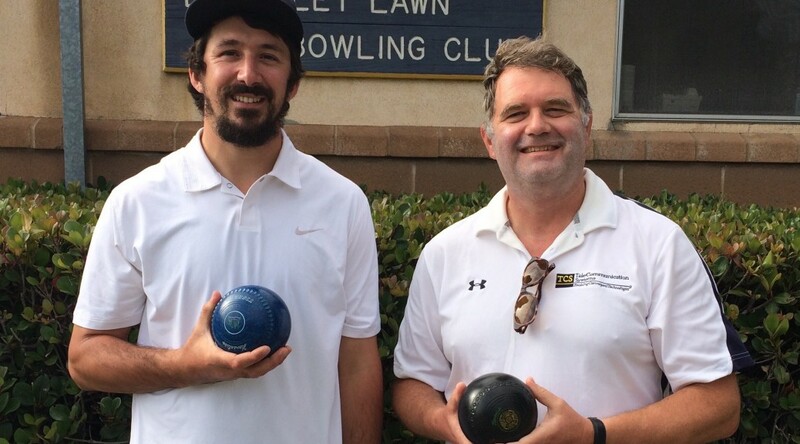 Figure 1 – Winning team (l-r): Rob (skip), Cris (vice) and Leslie (lead). 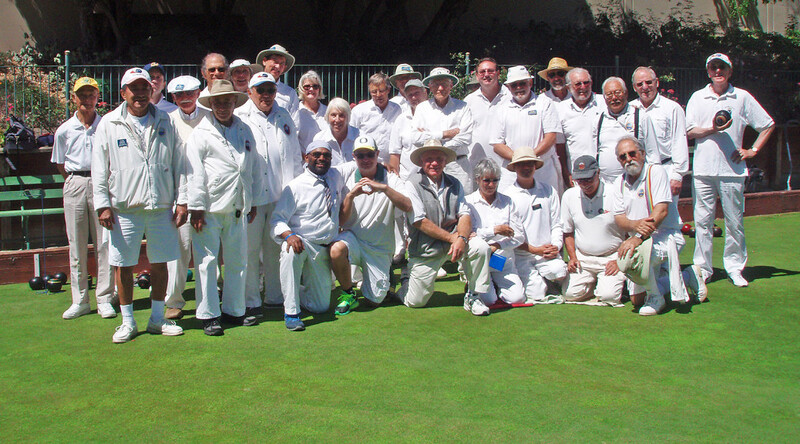 Ten hopeful bowlers showed up to bowl in the BLBC Pairs Draw Tournament. Before drawing to see who their partners would be, they had to find out who would be skipping and who would be leading. Due to the small number of skips, I had to ask two bowlers who prefer to bowl lead to bowl skip instead. Both graciously agreed to take on the task. After the draw, the teams of John Hooper & novice Hugo Deaux, Lennon Hamilton & Sarah Allday, Cris Benton & Millard Long, Rob Hoey & Ted Crum, and Shawn Roney & Ray Francis stepped onto the green. After bowling three 12-end games, the top two teams would bowl for the right to have their names on the Winners’ Board. Sadly, we had an uneven number of teams, so one team had a bye in each of the three games. On a more positive note: Most of the games were very close. In the third game, four teams were in contention for the top two spots. Shawn & Ray bested Rob & Ted by one point in a very close match. The win put them in 1st place. Cris & Millard won their match against Lennon & Sarah with enough plus points to capture 2nd place. The rinks were changed and the two teams began the game. All four players bowled very well–no great surprise there! At the end of the game, Shawn and Ray prevailed. Well done Shawn and Ray! An extra tip ‘o the hat to Ray. After 21 years, his name will now–finally, be on the Winners’ Board! Huge thanks to Susan and Sarah for helping to organize the food and getting the clubhouse ready for the tournament. Runners-up Cris Benton and Millard Long. 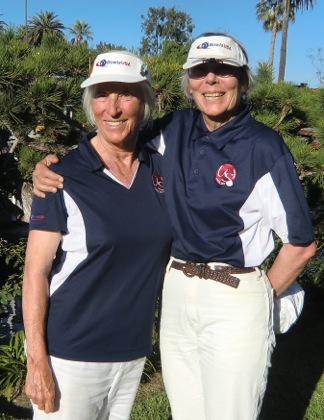 Some of you will remember the PIMD Women’s Fours Team of Ginger Harris, Mary Scott, Cathy Dinnean and I won 1st Place in the 2nd Flight at the US Open last September. Well, the PIMD ladies were at it again at this year’s SW Open. The Women’s Fours Team of Ginger Harris, Judith Perkins, Mary Scott and I bowled our way into the Championship battle for 1st and 2nd Place! The SW team (Maryna Hyland, Heather Stewart, Jan Hargraves and Betsy Lauryssen) won the toss, rolled a short jack and won the point. Over and over, we kept them to one or two points, but they kept rolling those pesky short jacks. Finally, when we were down 1 to 12, we adapted and won the point. Ginger asked me to roll a long jack, and I did. Over and over again. We crept up until we were two points from tying on the 14th end. Would this be yet again another sudden death play off? Sadly, it was not to be. But we sure made the SW team work for their win! My understanding is this is the first time in a long time that PIMD women’s teams made it to the Championship Flight. Well done to both PIMD Women’s Fours Teams! 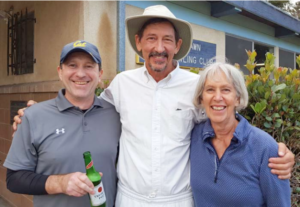 BLBC members Ann Brillhart, Cathy Dinnean, and Bob Schwartz were among the prize winners at the 2014 U.S. Open held at various greens in Southern California. 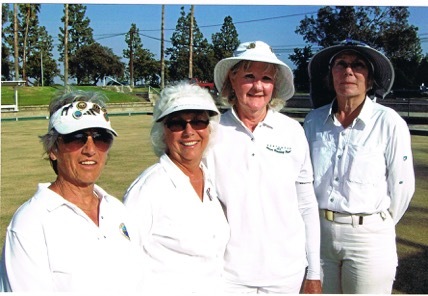 Ann and Cathy were part of the fours team (Ginger Harris (PALBC, skip), Mary Scott (SJLBC, vice skip). 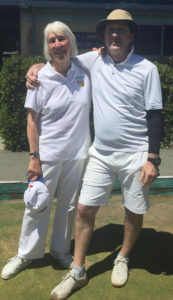 Cathy Dinnean (BLBC, Second) and Ann Brillhart (BLBC, Lead)) that won the second flight in the women’s fours, and Bob partnered Larry Collaco (Sunnyvale LBC) to the runner-up position in the fourth flight of the men’s pairs. Congratulations to Ann, Cathy, and Bob! Mario Galletta and BLBC’s Phil Grattan placed second. BLBC’s team of Robin Hoey and Shawn Roney placed third. 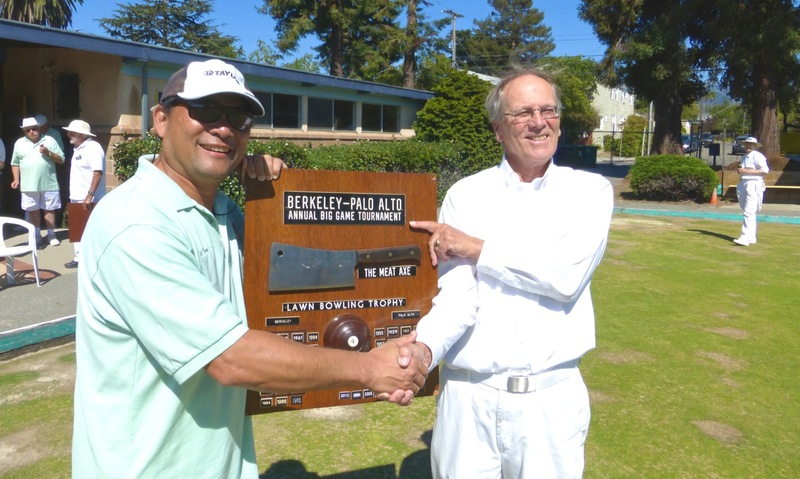 Larry Collaco and BLBC’s Bob Schwartz placed fourth.